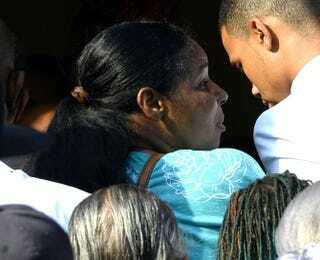 Esaw Garner, wife of Eric Garner, arrives for his funeral service on July 23, 2014, at the Bethel Baptist Church in Brooklyn, N.Y.
Eric Garner’s widow told a crowd Saturday that her husband was not “a violent man,” the Associated Press reports. Garner, 43, who was as big as or bigger than a professional football player in stature, “was not a violent man—in any way, shape or form,” Esaw Garner said in her first public remarks since her husband’s death about a week ago. She spoke at the Rev. Al Sharpton’s National Action Network in Harlem. “He was a quiet man, but he’s making a lot of noise now,” she said, referring to the vociferous uproar on social and mainstream media and within the civil rights community over cellphone videos that captured a New York City Police Department officer putting Garner in a choke hold during a sidewalk confrontation on July 17 in Staten Island, N.Y. Her remarks came just a day after she called on federal authorities Friday to launch a civil rights investigation against the officers who stopped Garner on suspicion of selling untaxed cigarettes, AP writes. It’s unclear what happened next, but we do know that Garner can be seen in viral videos pleading with the officers to leave him alone. That apparently did not happen for Garner, who appeared firm but not violent in his request, according to video footage. Still, the confrontation escalated, ending with Garner on the ground and in a choke hold. He’s heard on the video saying that he could not breathe. Later, he was pronounced dead at the hospital. Autopsy results are pending. Esaw Garner told the crowd Saturday that there was no sign of trouble the last time she heard from her husband via text about 30 minutes before the confrontation, the report says. “I’m good,” it read, according to the news site.